A Dutch brewer used discarded Christmas trees to make a seasonal IPA as part of its zero waste Lowlander Tree to Table recycling initiative. 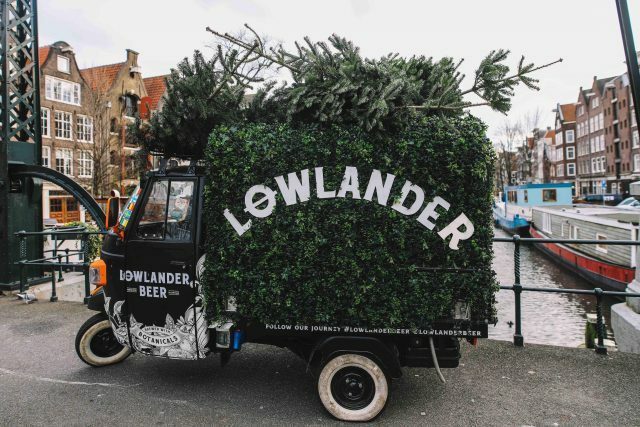 Dutch botanical brewery, Lowlander Beer, collected unwanted trees and used their needles to brew its 2019 Winter IPA, as well as a Lowlander Botanical Brut – a limited edition sparkling beer made from spruce and Champagne yeast. Around 600 kilos of needles needed to produce the 2019 batch of Winter IPA. The brewery has already partnered with organisations such as the Amsterdam Botanical Gardens, Amsterdam’s RAI Convention Centre, and restaurants, who have pledged to donate their trees after the festive period. Lowlander is also offering to collect any unwanted trees from people who wish to donate, but needs is crowdfunding to help with the collection and processing of all the trees. This season’s limited edition Winter IPA is a 5% white IPA, brewed with spruce needles and juniper berries, “combining the hoppy and balanced bitterness of a traditional IPA with the fresh maltiness of a witbier”.